Magny Cours is always the low spot of the year for non-Ferrari supporters. The track has been a happy hunting ground for the Italian team for so long that we approach it with gritted teeth and leave in despair at yet another victory for the enemy. And this year is no exception, with dire predictions from all sides of Ferrari dominance for the coming races, all of which are high speed, low downforce tracks similar to the Nevers circuit. I cheer myself up with the thought that things might not have been so easy for Ferrari if McLaren had not been penalized out of the hunt. Both Hamilton and Kovalainen were very quick on occasion during the race, if not in qualifying, and both would have pushed Kimi and Massa hard had all things been equal. The disappointment was BMW, of course, although this was to be expected. Word is that the F1.08 is not happy on circuits where aerodynamics are most important, so it should have been no surprise that Kubica and Heidfeld struggled for balance here. The good news was that Nick seems to be getting closer to Kubica in qualifying, only the split between Q2 and Q3 disguising the German's improvement. But hope springs eternal in a BMW supporter's heart and so I put much store by Dr Theissen's assurance that things will be better at Silverstone. In fact, I fully expect other teams to fare better there as well, remembering other years in which the gloom of Magny Cours has been dispelled by closer competition in the races that follow. Perhaps the most interesting point to ponder will be the performance of the Toyotas. They leap-frogged BMW in the French race, proving that the car likes Ferrari circuits, and should continue this in the next few races. But will they? I must admit that I doubt it, so often have they promised well in the past only to disappoint. There is something about the team that prevents them having a long run of success and I can see them dropping back to the midfield in Britain. Trulli continues to do an amazing job in qualifying but his team mate, Glock, gave ominous evidence of their usual tailing off in performance through the French race. Jarno may have managed to hold on to 3rd place but the fact remains that he could do little to close the gap to an ailing Ferrari ahead of him. Red Bull seem to be getting their act together at last and I would not be surprised to see Webber and Coulthard in Q3 again at Silverstone. Renault, too, are beavering away at their car and are likely to be improving from now onwards. The competition behind the first three teams is likely to become very fierce from now on. Which leaves Williams, Toro Rosso, Honda and Force India. I am unconvinced by the promise shown by the STR3 since its debut, just as I am disappointed with Williams' failure to keep up with the pace of development. There may be races where these teams shine but I doubt their ability to be consistent challengers. Honda are looking towards next year and so are not really pushing hard and Force India still struggle to close the gap. With luck, therefore, the mid-season races should be closely fought and the championships remain undecided until quite late in the year. That is good for the sport and the fans and a much rosier outlook than we might have entertained in France. And I'm still hoping for a win for Heidfeld this year. Is it just me, or does it seem that the number of controversies per race is increasing dramatically? The events in France generated tons oc comments on all the popular F1 sites. I haven't seen this level of controversy since Max's foolishness. I wonder what the British Grand Prix will bring. I haven't seen this level of controversy since Max's foolishness. I wonder what the British Grand Prix will bring. Nice sum up Clive, I too am a little disappointed by Williams. Each year they appear to run okay in pre-season testing, they start the year looking like they'll improve on the previous year's form, and then they disappear into the midfield never to be seen for the remainder of the season. Before the year started, Keith Collantine asked several bloggers to predict what we thought would be the big story of 2008. I don't think any of us guessed that it would be Max caught with his pants down! Ollie: That would be a nice controversy to set against all the others! This is the only race i have missed this year, sadly both the original program on tv, and then the re-run. Don't ask me how this happened, but i can promise it wount happen again. One thing i think is worth mentioning is that Nelsinho finally got his act together and even got across the finishline before Alonso. As you know, i'm no fan of Alonso, so this is great music to my ears. Other than that, i can no more than agree with you. It have even gone so far that i have stopped to be amazed about how Toyota fails to keep their pace up when they finally have found some speed. I just have one question, do you have anything to report on Coulthard? Have'nt read anything about the guy and how he did in the race. Did he managed not to be in the way of any of the drivers this time? I couldn't agree more with you Clive about Toyota and Williams. 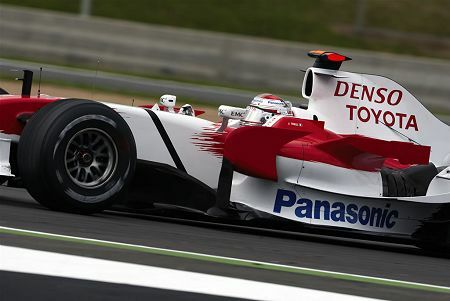 Williams are a great team, struggling for resources, Toyota are a great resource, struggling to be a team. Frank needs to do a deal much like the one Sauber did with BMW or McLaren with Mercedes. They'd quickly hit the front. Especially with a Trulli/Rosberg line-up. I've always been an admirer of Jarno on the quiet since his F3 days, and he is in the form of his life this year. F1 Punter: You're right, there was someone who predicted a Mosleygate! Was it you? Björn: Coulthard had an uneventful race, for once, ending up just outside the points in 9th spot. Overall, the Red Bull team had a slightly disappointing race, in spite of Webber's sixth. They were not quite as quick as they had hoped to be but did well to get both cars to the finish. As McLaren supporter, I´m Just waiting until Silvastone to knock down my king. Looking back to those 8 races I´m starting to understand that BMW would be the perfect team to bit the enemy. Mainly because of the way that his two drivers works, each one in a different polar of driving style, something that helps the team to choose in each one ALL the resources must to be invested. Another because Bob is in his best shape ever, away of the press mess that Lewis is in. There are still too much inputs of Brawn, Todt and Michael floating around Maranello and McLaren are struggling to maximize the amount of Ferrari´s mistakes in his own favor. I still believe in Heikky, but I have some doubts about the way that Ron manages his driver’s policy. Ok, I understand that was that policy that let the raw talent of Lewis arises but at the moment I think that he must to look back to Schumacher era as a Case of study and reconsider his policy. Clive: I think you are also dead right about the possibility of it happening I'm afraid. I agree with you - I was just indulging in a spot of wishful thinking!